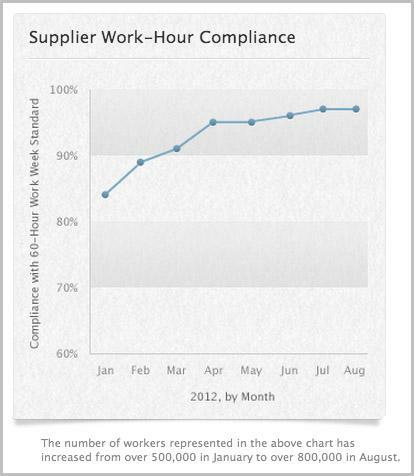 In a brief update to its Supplier Responsibility webpage, Apple quietly announced it is now tracking over 800,000 workers at supply chain factories in China, and noted 97 percent of those employees have 60-hour work weeks as mandated by that country's laws. The 800,000 number, first spotted by The Next Web, is a substantial increase from the 500,000 tracked workers reported in January, and while the percentage of those working excessive hours has decreased over the intervening months, there has been no change in compliance since July. In January, over 70,000 supply chain employees were working over 60 hours a week, though the number dropped precipitously since then, possibly as a result Apple's partnership with the Fair Labor Association in February. By extrapolating the latest data, as of August there were still over 24,000 Chinese laborers working what Apple considers excessive hours, however compliance with labor rules appears to be slowly rising. Apple's Chinese manufacturing partners, more specifically Foxconn, became the target of a mass media firestorm (1, 2) regarding labor abuse allegations sparked by a story from monologuist Mike Daisey which aired on NPR. The tale was found to be a fabrication and Daisey was forced to apologize, prompting high-profile publications to issue retractions. Despite the exaggerated claims, Apple and Foxconn pushed hard to raise working standards, a process that continues to yield positive results. Most recently, Foxconn was in the news again as a 2,000-person riot shut down the company's Taiyuan factory, the plant reportedly responsible for processing the iPhone 5's backplates.